(Nanowerk News) Working together to study friction on the atomic scale, researchers at UC Merced and the University of Pennsylvania have conducted the first atomic-scale experiments and simulations of friction at overlapping speeds. 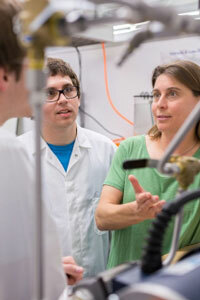 Professor Ashlie Martini and her students study friction at the atomic level. In “Dynamics of Atomic Stick-Slip Friction Examined with Atomic Force Microscopy and Atomistic Simulations at Overlapping Speeds”, Opens a New Window. a paper published in Physical Review Letters, UC Merced engineering Professor Ashlie Martini, graduate student Zhijiang Ye and their partners at Penn reveal how they overcame the technological limitations of studying friction at such a small scale. They hope their work will eventually lead to greater insights into how to control friction and wear on machinery.